Smartphones are changing how organizations do business—they are more than just smart Web browsers. As I noted last week, purchases from mobile phones have dramatically increased during the holiday shopping season. The infographic from IfByPhone demonstrates how people are using their smartphones not only to buy things and research products, but also to open emails and access social media. Users also still call organizations on the go. 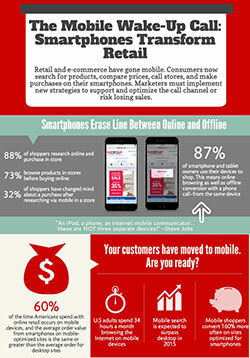 87% of smartphone and tablet owners use their devices to shop. This means online browsing as well as an offline conversation. 61% of people believe it’s important for an organization to have a phone number listed on a website. 70% of mobile searchers call organization phone numbers, Google reports. 67% of online shoppers will call a company about a purchase of more than $100. The infographic suggests based on the data that organizations should have a “click to call” link on every mobile optimized page. Agencies have been highlighting traditional channels on their mobile websites and native apps. In the spring, I noted some examples of good practices by federal agencies when it comes to tying contact centers with their mobile products. Should agencies have a click to call on every mobile page? Sounds like a good discussions for the Government Contact Center Council and the MobileGov Community of Practice.